Your guide, Gismu, will welcome you on your arrival at Addis Ababa Bole International Airport and accompany you to the Ghion Hotel. City tour of Addis Ababa. After breakfast transfer to airport to fly to Gondar. 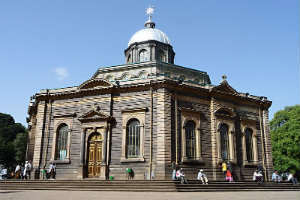 Established by King Fasiledes in 1636, this town was the capital of Ethiopia in the 17th century. 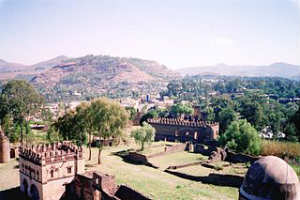 Visit the Castles of Gondar (included in the World Heritage List), the Royal Fasiledes Bath and the Church of Debre Berhan Selassie with its unique murals. Overnight Goha Hotel (2100m). 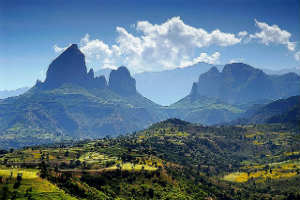 Early departure and drive to Debark, the headquarters of the Simien Mountains National Park. Here we pay the park entrance fees and collect a scout who will accompany us. 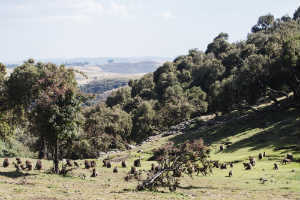 We then continue driving to Sankaber (31 Kms), the first campsite of the National Park. On this drive you will gain your first impressions of the scale and beauty of this highland region and the extraordinary scenery. 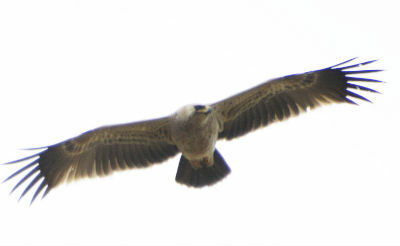 You will enjoy seeing the endemic Gelada Baboons and the bone-breaker giant Lammergeier Vultures soaring overhead. Overnight camping at Sankaber (3200 m). Today we collect the mules and muleteers who will transport our camping gear and food for the trek to Ras Dashen. We embark on our journey into the National Park, walking from Sankaber to Geech. After about 1.5 hours walk we see the Jinnbar River and Falls. We cross the river later in the day and then ascend for about two hours to Geech, which is full of Giant Lobelias. 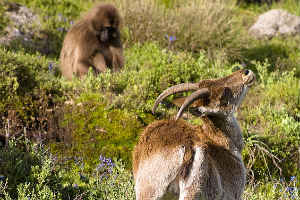 The scenery is wonderful, and groups of the endemic Gelada Baboon can be seen on our way. Today's walk takes 5-6 hours. Overnight camping at Geech Campsite (3600m). 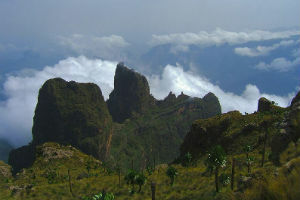 This day we will be trekking to the best viewpoints in the National Park. First we walk to Imetegogo where there are panoramic views from 3600m. After a short stay here we continue our walk to Seha, another terrific viewpoint, where we have our picnic lunch. From here we continue to the last viewpoint, Quedadit, before returning to the campsite. 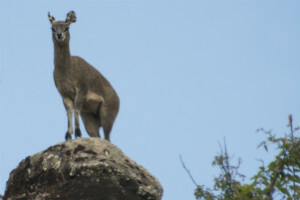 If we are lucky we might have the chance to see mammals such as the Simien Wolf, Walia Ibex and Klipspringer. Today's walk takes 4-5 hours. Overnight camping at Geech Campsite (3600m). 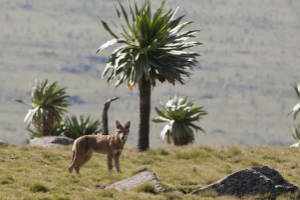 We will be walking among the giant Lobelia trees and under which African Field Rats are commonly found. After a picnic lunch we walk on the edge of the Enatye Escarpment (4000m), another breathtaking viewpoint. 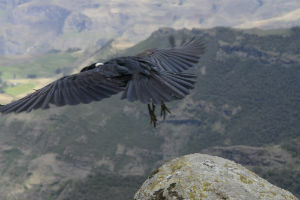 Finally we descend to Chenek which is the best place to see Walia Ibex and Gelada Baboons. Today's walk takes 6-7 hours. Overnight camping at Chenek (3600m). We trek up Mount Buhit (4430m), the second highest peak in The Simien Mountain range, giving excellent views over the whole area. After refreshments at the summit we descend towards Chero Laba, crossing the Mesheha River. We finally reach Ambiquo and spend the night here, before the big day on Ras Dashen. Today's walk takes 7-8 hours. Overnight camping at Ambiquo (3200m). 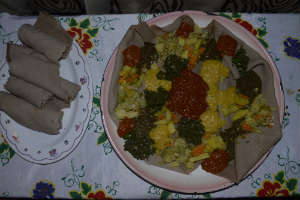 "Ras Dashen" with the permission of Danni Jensen. 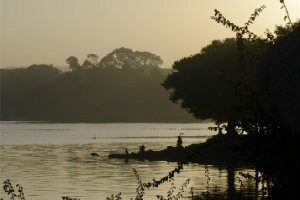 We get up in the pre-dawn chill for what will be the most challenging day of the trek. To reach the summit of Ras Dashen can take up to 6 hrs. We head up the valley from the campsite to the small village of Mizma. From here we climb steeply upwards to reach a natural amphitheatre made of three huge rock buttresses, one of which is our goal, Ras Dashen. It is then an easy scramble to the summit. After taking in the impressive views we descend back to Ambiquo where we stay overnight. Today's walk takes 8-10 hours. Overnight camping at Ambiquo (3200m). We walk from Ambiquo to Sona through a magnificent landscape. En route we will see Mount Wali Kend and Mount Silky in the distance. Overnight camping in Sona. We start by walking downhill for about 2 hours before crossing a river. There will be a chance to swim and wash clothes before continuing to Mekarebia. Overnight camping. This day offers another opportunity to swim. In the afternoon we ascend for 2 hours before we reach Mullit. Overnight camping. 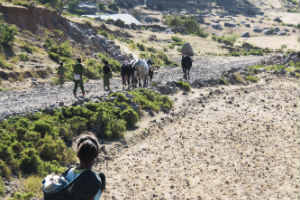 We have a short trek from Mulit to Aderkay where we meet our vehicles and return to Gondar. Today's walk takes 2 hours. Overnight Goha Hotel. After breakfast we fly from Gondar to Addis Ababa. Evening farewell dinner in one of the traditional Ethiopian restaurants. You will be entertained with dances from different ethnic groups. Transfer to Bole Airport.